In an effort to improve leach kinetics and recoveries of primary copper concentrates, minerals process solutions provider FLSmidth developed the Rapid Oxidative Leach (ROL) process – capable of attaining over 97% copper dissolution in less than six hours under atmospheric conditions. This technology has been reported extensively in the pages of International Mining magazine, including in the soon-to-be-published November heap leaching, ISR and SX feature. This advance is particularly significant as the life cycle of many copper orebodies sees the mineralogy transitioning from oxides to secondary and primary sulphides, which have decreasing ore grades and are more difficult to process. These operations need cost efficient leach processes to maintain their copper production, and also to take advantage of newly discovered orebodies, especially those containing arsenic-rich minerals like enargite. In the FLSmidth ROL process, a simple way has been found to leach copper sulphide concentrates, with chalcopyrite as the predominant copper-bearing mineral, at 85 to 95°C and under atmospheric pressure. 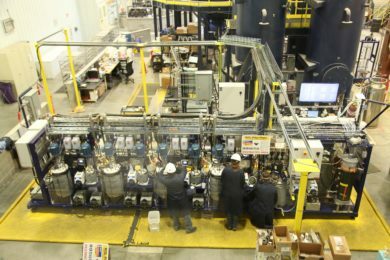 At a pilot plant facility at FLSmidth’s technology centre in Salt Lake City, USA, over 250 batch leach tests have been completed in 10 and 100 litre reactors, using copper concentrates from over thirty different sources. The efficiency of the FLSmidth ROL process is based on a mechano-chemical approach that takes advantage of transitory surface defect structures generated during particle fracture. A patented activation process is employed that chemically alters the mineral lattice structure, promoting rapid dissolution of the metals into solution. Most of FLSmidth’s test work to date has been on primary chalcopyrite concentrates, although there has been some focus on enargite and arsenopyrite concentrates. The rapid leach kinetics and high copper recoveries place FLSmidth ROL’s process economics on par with stirred-tank leaching of secondary copper sulphide concentrates. The key to the high performance of the process is the use of very low energy, inter-stage or intra-stage attrition along with the activation of the mineral to enhance the selective dissolution of copper-bearing minerals. The process uses a series of stirred media reactors placed in tandem with conventional stirred leach tanks to achieve its high copper recoveries from sulphide concentrates. The inter-stage or intra-stage placement of the reactors provides the advantage of mechano-chemical activation processes while adding only minimally to baseline processing costs. These costs are further reduced by optimising the volume ratio between the stirred leach tanks and the reactors. Indeed, the full-scale FLSmidth ROL processing costs are estimated to be only marginally above the cost of stirred-tank leaching of secondary copper sulphides. Minimum concentrate grades of about 7% Cu could be economically viable to process via this process. There are currently a number of copper hydrometallurgical facilities around the world with SX-EW plants where the oxide orebodies are being depleted, and the mines will start moving into transitional and sulphide zones. With the FLSmidth ROL process, a grinding circuit with bulk flotation can be added upstream of the existing SX-EW plant, and a bulk concentrate can be leached. This can be followed by counter-current decantation with the resulting pregnant leach solutions (PLS) fed to the existing SX-EW facility. The higher copper tenor PLS can either be blended with the lower copper tenor PLS from the existing heap leach facility, or it can be fed directly into the existing SX-EW plant. The research and testing have demonstrated that there are potential applications for the ROL process in treating low grade to medium grade concentrates and arsenic-rich concentrates, as well as electro-refinery and smelter materials; and while the copper industry has been the main area of focus for this technology, there are other industries that could also use the process. For the gold sector, results of this test work indicate that pyrite can be readily leached mechano-chemically at more moderate temperatures and pressures than those used in existing refractory ore treatment options. The FLSmidth ROL technology has applications for other metal sulphide minerals such as sphalerite and galena. Zinc is often separated from polymetallic ores via flotation processes, but the FLSmidth ROL technology rapidly leaches sphalerite, providing an alternative processing route to zinc smelting. The zinc PLS solution can then be further processed via SX-EW.